The first time I holidayed in the Vendee was over 10 years ago with my family. It was a last minute thing, and all we knew about the region was it was famous for its beaches, and the impressive historical theme park, Puy du Fou. So, for 2 weeks, much to my mum’s chagrin, we spent every day by the swimming pool, or at the beach, 1 day at Puy du Fou, and another visiting La Rochelle. We had NO idea of the beautiful seaside towns located no more than 30 minutes away! 2 years ago, I came back to the Vendee to work, and decided I would venture to one of these towns. 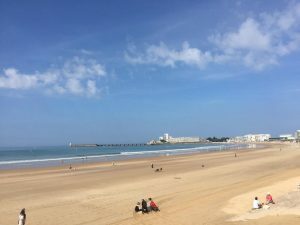 I chose Les Sables d’ Olonne, and boy, was I glad I decided to drive past the E. Leclerc, and headed towards the harbour to park. The harbour is home to restaurants and bars, and is where the water taxi from La Chaume docks. La Chaume offers quaint cafes, and pretty streets, and also has free parking, perfect if you have a high car, or roof-box as many of the carparks in Les Sables have height restrictions. Following the harbour road around the bay, the Grand Plage comes in to view, and in the summer months, this becomes a pedestrian only zone. It’s easy to promenade along the front taking in the grand plat plage on one side, and on the other, the ornate buildings where the Parisian elite holiday in apartments, with bars, restaurants, cafes and shops below. On summer evenings, head down to the promenade for an ice cream of crepe, and enjoy the evening entertainment from live bands to magicians, and take a turn on the Edwardian carousel, opposite the tourist information office and Casino. During the day, surf and sailing schools can be found on the Grand Plage, and are suitable for all abilities and ages to enrol in. Head towards the church and covered market hall through the narrow alleys and discover boutiques, cafes and art galleries. Keep an eye out for Ile Penotte, a small collection of houses with ornate murals made from shells. I can spend hours wandering through the alleys of Les Sables d’ Olonne, and never get tired of the view from the Prom of the Grand Plage. 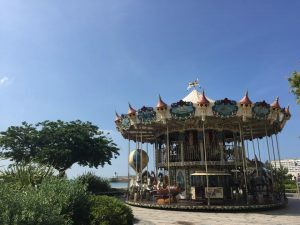 Les Sables is a town with something that suits everyone, and offers a children’s play park, carousel, arcade, casino, museums and zoo; as well as ample parking. 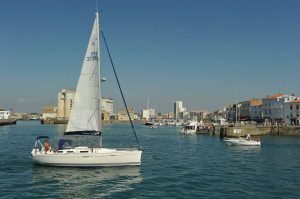 Situated only 30 minutes away, it’s easy to spend several afternoons and evenings enjoying Les Sables d’ Olonne.